Deciding on new furniture for your home is never easy. There are many materials to choose from, and they all serve different purposes and fit different aesthetics. You may feel hesitant to include glass in your home furniture, but if you have a vision, let it come to life. There are benefits to elegant glass pieces that you should definitely consider. For one thing, glass doesn’t damage as easily as wood. While wood is sturdy, it needs regular maintenance to allow its natural beauty to shine. Additionally, glass tables don’t have edges, making them safe around kids and a suitable addition to any family’s living space. Wooden tables have sharp corners, making it easy to accidentally bump yourself. Finally, glass can effortlessly update a space. Sometimes, instead of repainting or completely renovating a room, the furniture can make all the difference in a room’s feel. Here are some of our favorite ways to style round glass side tables in our homes. Unfortunately, many overlook their home’s entryway. But first impressions are important—from the moment you walk into a home, you’re observing the furniture, décor, and overall atmosphere. A small glass table is a delicate invitation into your home, offering that warm feeling guests typically expect. It’s a versatile piece, a place where you can put keys, a floral arrangement, family photos, or seasonal centerpieces. No matter how you want to use the glass table, you can restyle it over and over again through the changing seasons. 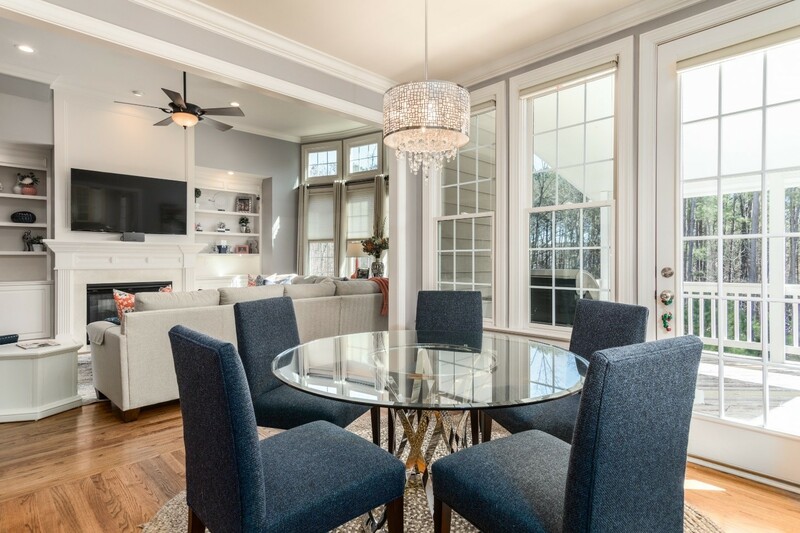 Additionally, a glass table reflects the light coming into your home, making even the smallest and narrowest of spaces appear bigger and brighter. Creating the coziest room in your home takes a lot of planning. You have to make sure the theme is cohesive, and you also need plenty of space and accommodating furniture for guests. Whether you want to host a game night with friends and family or get comfortable with a good book and a warm drink, a side table is essential. You can also use a glass top coffee table, which is certain to draw attention. A small glass top table can also serve as a wonderful catchall. Your living room is certain to be home to multiple remotes, mugs, and other trinkets, and they have to go somewhere. 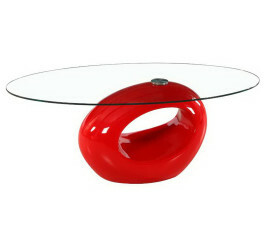 If you’re searching for a piece that seamlessly combines both style and functionality, a glass table is the way to go. 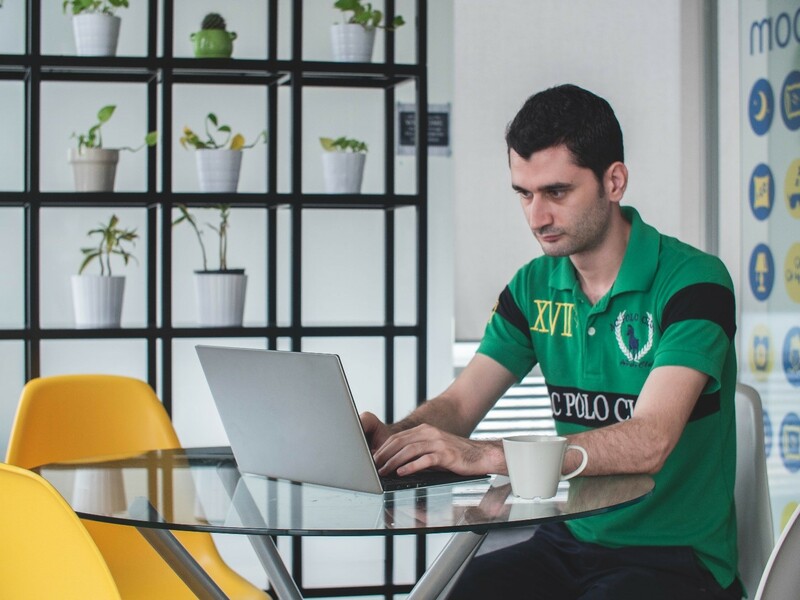 In your home, the den or office is probably one of the more understated rooms—you want it to be sleek, modern, and minimalistic. At the same time, however, you need a space to house everyday items like books, pens, and your laptop or desktop computer. Fortunately, a glass table blends together style and purpose. A glass top adds a sophisticated look to any home office while providing sturdiness and plenty of space. It also acts as the ideal centerpiece to any workspace. Power through the day’s work behind a table that looks clean and contemporary. Often, adorning your room with the “right” pieces is the most difficult part of the interior decoration process. You want your bedroom to capture exactly what you’ve envisioned, and glass can effortlessly add the elegance you crave to one of the most intimate areas of your home. Light can easily shine through the glass, bouncing off the walls and painting a beautiful bedroom scene. If you need a place to rest your personal belongings, set them atop a glass table. Accent lamps also look beautiful on these bedside pieces. The breakfast table is a simple, calm place where you can clear your mind and prepare for the day over your favorite treats. Why not make it a stylish, elegant place you can enjoy every morning? A round glass side table adds visual interest while remaining a functional part of your kitchen. 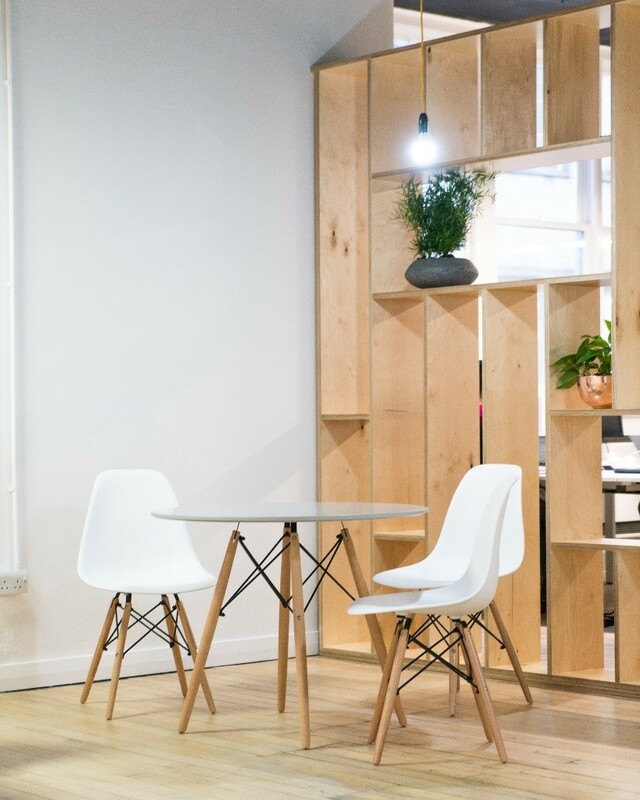 Plus, unlike a long wooden table, it doesn’t overpower the rest of the room. Furthermore, if you’re looking for easy clean-up, glass doesn’t stain. It’s like it was made to handle food! If you’re searching for a space-saving centerpiece for your kitchen, a glass breakfast table is a great choice. You may be thinking about opting for plastic or wicker patio tables, but small glass top tables actually work wonderfully for outdoor settings. They offer convenience, especially if you’re entertaining outside. Many are partial to stepping out into nature for inspiration and a breath of fresh air, and it’s easy to keep a journal or snack tableside with a new patio accessory. Enhance your outdoor space with a piece that boasts both luxury and family fun. They’re even easy to clean, so you can clear off any dirt and debris with ease. In addition to the classic circles, glass patio tables come in a multitude of other shapes, including squares, rectangles, and even irregular shapes. Fab Glass and Mirror is a reliable glass supplier who’s dedicated to your unique requirements. 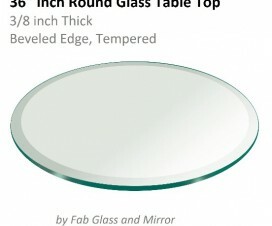 We offer a wide array of glass table tops and mirrors for homes and offices. We understand that it’s your home, so the details need to be just right for you. In addition to our readymade stock, if you require specific measurements, we also offer customization options. Our easy-to-use tool allows you to select the dimensions, glass type, thickness, and edging of your table top. Simply tell us how we should cut your glass and you’re ready to place your order. Shipping anywhere nationwide, our orders always arrive in carefully-wrapped packaging, so you won’t have to worry about damage. You can relax knowing that we’ve designed a glass top table that perfectly complements your living area or workplace’s aesthetic. Plus, with our fast turnaround time, you can expect to receive your glass top table quickly. If you’re unsure what to order, one of our experts can help you as you create your ideal space. We take pride in our excellent customer service—give us a call today! 36 Inch Round Glass Table Top for Perfect Living Room Interiors! Make a Perfect Use of Little Space with Round Glass Table Tops! 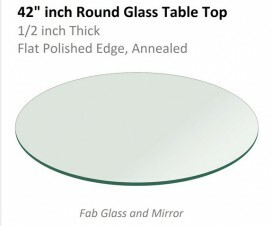 Beautify Your Interiors with 42 Inch Round Glass Table Top!